36 OUNCES OF WATER IS NEEDED TO PRODUCE ONE 12 OUNCE PLASTIC WATER BOTTLE. 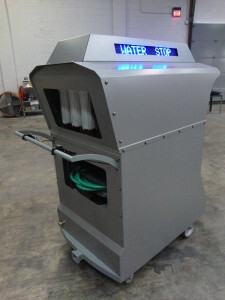 Nan Harris CEO of WaterStop Carts approached Sigma Design to develop a new mobile water distribution technology. WaterStop Carts are mobile water filtering units that transform municipal, recycled, reclaimed, and desalinated water to the taste and purity of bottled water. With refillable cups and containers instead of manufactured plastic water bottles, WaterStop Carts are an environmentally sound way to distribute water. The tank on each WaterStop Cart holds 50 gallons, the equivalent of 400-16oz bottles of water. Each refill generates a savings of 100 gallons of water used in the manufacturing and distribution of bottled water. The 4 -minute video of the prototype WaterStop cart shows how it works. https://vimeo.com/66376983. Sigma is the manufacturer of the WaterStop Cart. We will be developing a second generation cart which will also serve as a WiFi Hot Spot to better connect students and communities to the world via internet. Water Purification Technology Development, Electrical Power and Controls Design, Food Safety Review, Mechanical System Design, Fabricating, Testing and Validation.